See other locations named Teplice. Teplice (Czech pronunciation: [ˈtɛplɪtsɛ]); Teplice-Šanov until 1948 (Czech pronunciation: [ˈtɛplɪtsɛ ˈʃanof]; German: Teplitz-Schönau) is a statutory city in the Ústí nad Labem Region of the Czech Republic, the capital of Teplice District. It is the state's second largest spa town, after Karlovy Vary. Teplice is located in the North Bohemia region, near the border with the German state of Saxony. It is situated in the valley of the Bílina river between the slopes of the Ore Mountains (Czech: Krušné Hory) in the northwest and the Central Bohemian Uplands (České středohoří) in the southeast, about 15 km (9.3 mi) west of Ústí nad Labem. The municipal area comprises the cadastral communities of Teplice proper, Prosetice, Nová Ves, Řetenice, Hudcov, Trnovany, and Sobědruhy. According to the 1541 Annales Bohemorum by chronicler Wenceslaus Hajek, the thermal springs are fabled to have been discovered as early as 762; however, the first authentic mention of the baths occurred in the 16th century. The settlement of Trnovany was first documented in a 1057 deed, while Teplice proper was first mentioned about 1158, when Judith of Thuringia, queen consort of King Vladislaus II of Bohemia, founded a Benedictine nunnery ad aquas calidas ("at the hot springs"), the second in Bohemia. A fortified town arose around the monastery, which was destroyed in the course of the Hussite Wars after the 1426 Battle of Aussig. In the late 15th century, queen consort Joanna of Rožmitál, wife of King George of Poděbrady, had a castle erected on the ruins. The name "Teplice" is derived from the Old Czech, meaning "hot spring". Teplice figures in the history of the Thirty Years' War, when it was a possession of the Protestant Bohemian noble Vilém Kinský, who was assassinated together with Generalissimo Albrecht von Wallenstein at Cheb in 1634. The Habsburg emperor Ferdinand II thereafter enfeoffed castle and town to his general Johann von Aldringen, who nevertheless was killed in battle in the same year, and Teplice fell to his sister Anna Maria von Clary-Aldringen. Consequently, and until 1945, Teplitz Castle was the primarily seat of the princely House of Clary-Aldringen. After the Thirty Years' War, the devastated town was the destination of many German settlers. After a blaze in 1793, large parts of the town were rebuilt in a Neoclassical style. The health resort was a popular venue for wealthy bourgeois like the poet Johann Gottfried Seume, who died on his stay in 1810, or Ludwig van Beethoven, who met here with Johann Wolfgang von Goethe in 1812; as well as for European monarchs. During the Napoleonic War of the Sixth Coalition, Teplice in August 1813 was the site where Emperor Francis I of Austria, Emperor Alexander I of Russia and King Frederick William III of Prussia first signed the triple alliance against Napoleon I of France that led to the coalition victory at the nearby Battle of Kulm. In 1895, Teplice merged with neighbouring Lázně Šanov (Schönau). Upon the dissolution of Austria-Hungary after World War I and the 1919 Treaty of Saint-Germain-en-Laye, the predominantly German-speaking population found itself in newly established Czechoslovakia. Right-wing political groups like the German National Socialist Worker's Party referred to themselves as Volksdeutsche and began to urge for a unification with Germany, their efforts laid the foundation for the rise of the Sudeten German Party under Konrad Henlein after 1933. With the Sudetenland, Teplice was annexed by Nazi Germany according to the 1938 Munich Agreement and incorporated into a Reichsgau. At the same time, the persecution and expulsion of the Jewish population began with the demolition of the Teplice Synagogue, once the largest in Bohemia, on 14 March 1939 and finishing with the deportation of the remaining Jews to Theresienstadt and their extermination at Auschwitz. After World War II the Czechoslovak government enacted the Beneš decrees, whereafter the German-speaking majority of the population was expelled from Teplice. 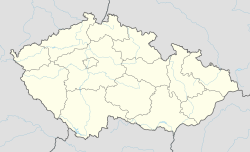 In 1945, the Princes of Clary-Aldringen, lords of Teplice since 1634, were expropriated. In 1994, Jaroslav Kubera of the Civic Democratic Party (ODS) became mayor of Teplice and he held the position until 2018. Teplice is home to the professional football club FK Teplice playing in the Gambrinus liga. Notable players of the club include Josef Masopust and Pavel Verbíř. The stadium, Na Stínadlech, is one of the largest in the country and has hosted international matches. Richard Wagner began composing the music to his opera Tannhäuser during a vacation in Teplitz in the summer of 1843. The punk rock musician and model Barbara Fava as known as Barbarina (born in 1986). Memorial for fallen pilots of the 15th division of the US air force. Inscription: "To honor the memory of the pilots of the 15th aerial army of the USA who died during the aerial battles over Teplice in the years 1944-1945." ^ Lutterer, Ivan; Majtán, Ivan; Šrámek, Rudolf (1982). Zeměpisná jména Československa. Slovník vybraných zeměpisných jmen s výkladem jejich původu a historického vývoje. Prague: Mladá Fronta. pp. 301–302. Wikimedia Commons has media related to Teplice.